By-Election Result: Rahul Gandhi congratulated the Rajasthan Congress for the wins. 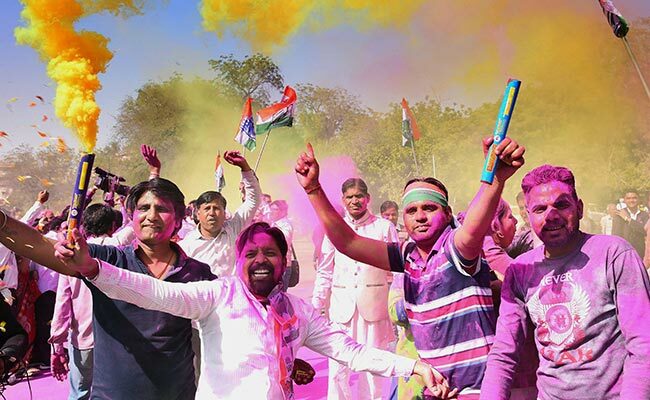 New Delhi: The Congress today raced ahead of the BJP and won the Lok Sabha constituencies of Ajmer and Alwar as well as the Mandalgarh Assembly seat in Rajasthan where by-elections were held on Monday. The latest wins could be indicative of a changing political gradient in the electoral landscape of the state that goes to polls later this year. In West Bengal, Mamata Banerjee's Trinamool Congress also won Uluberia parliamentary, which it held, and the Noapara assembly seat, which was with the Congress. The Rajasthan by-elections are seen as a test of the popularity of the BJP government led by Chief Minister Vasundhara Raje. The BJP has been in power in the state since 2013 and in the 2014 national election had won all the state's 25 seats. The Congress, led by state chief Sachin Pilot, campaigned aggressively for the by-elections. It's a prestige battle for Mr Pilot, who was the Ajmer member of Parliament before he lost the seat to the BJP as a Modi wave swept the state. The Congress hopes to divest the BJP of Rajasthan in the assembly elections now months away, counting on an anti-incumbency sentiment. "People have expressed their regard for the Vasundhara Raje government. Congress leads show politics of polarisation won't work," Mr Pilot said. In Ajmer, where the Congress won with a huge margin, the BJP has battled the ire of Rajput groups, who urged their community to vote against the ruling party over the controversy over the Bollywood movie "Padmaavat". They claimed that the film distorts history and demanded a ban on its release. In the run-up to the by-election in Alwar, where several incidents of cow vigilantism were reported, the Congress accused the BJP of polarising voters. Alwar is home to nearly three lakh Meo Muslims -- traditional cattle rearers like 55-year-old Pehlu Khan, who was beaten to death in April last year, allegedly by cow vigilantes. The Congress has snatched it from the BJP. All three seats are linked to Congress president Rahul Gandhi's top lieutenants in Rajasthan - Mr Pilot, CP Joshi and Jitendra Singh Bhanwar. In West Bengal, the ruling Trinamool Congress is continuing an unstopped march that began with a sweep of the state in 2011 after three decades of Left rule. TMC's Sunil Singh today won the Noapara seat by over 63,000 votes and Sajda Ahmed, widow of lawmaker Sultan Ahmed, takes the lead in Uluberia, which has a large Muslim population. In both the Bengal seats, the BJP put up a tough fight looking to bolster its claim that it is now Bengal's chief opposition party. The CPM, too, tried its best to gain ground in the seats, but finished third. Even as the Congress made a huge comeback in Rajasthan, it came fourth and lost Noapara, which it had won in the 2016 Assembly polls in alliance with the Left Front. In Uluberia, too, the Congress was a distant fourth.